(Phys.org) —Researchers working at the Super Cryogenic Dark Matter Search (CDMS) facility, located underground in Minnesota's Soudan Mine, are reporting in a paper uploaded to the preprint server arXiv that they've found three events that lie in the signal range of Weakly Interacting Massive Particles (WIMPs). 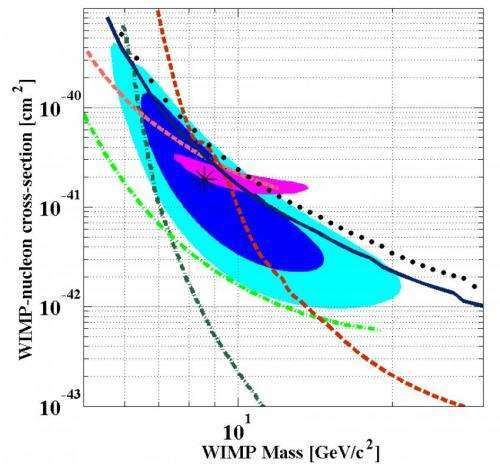 The group also gave a talk detailing their results to an audience at this year's American Physical Society meeting—as part of that discussion, they made it clear the noted events do not rise to the level of discovery, nor do they imply the team has found evidence of the existence of dark matter. Researchers in several facilities around the world (and aboard the International Space Station) are looking for evidence of WIMPs, because theory suggests that they constitute dark matter, the invisible material believed to make up approximately 85 percent of all matter that exists in the universe. Because WIMPs can't be seen directly, researchers look to events that might prove they exist, such as collisions between WIMPs and atomic nuclei. In order to find such evidence, researchers set up detectors they hope will catch such collisions that occur due to gravitational pull on WIMPs—they are believed to interact only rarely with normal matter through other means. 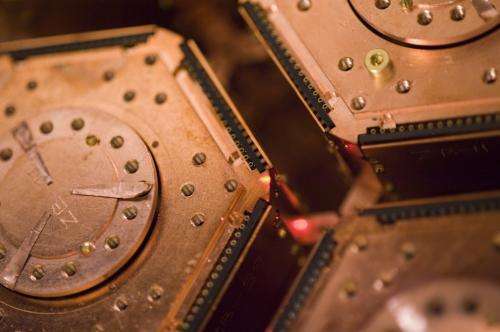 Researchers at the Super-CDMS facility have set up eight silicon detectors (cooled to -459.67 degrees Fahrenheit) in the hope of detecting the slight amount of heat given off by a collision between a WIMP and an atom's nucleus. The researchers report detection of three events that might have been the result of such collisions, though they are quick to add that the events might also have been due to something else, such as statistical errors. However, calculations indicate the events are 99.81 percent more likely to be WIMPs than background fluctuations, which translates to approximately a three-sigma level of confidence. Interestingly, if the detected events do turn out to be the result of WIMP/nucleus collisions, it will mean that WIMPs are much lighter than scientists have been expecting—the detected collisions detected to just 8.6 giga-electronvolts. The researchers note this finding is in line with results from other research efforts, though they also acknowledge that it contradicts the findings of other researchers. Regardless, research at the Super-CDMS facility and elsewhere will continue until WIMP collisions are proven to exist, or not. E. Figueroa-Feliciano's presentation at Light Dark Matter 2013. It's the similar case, like the recent hype about "evidence of WIMPs"published recently at AMS. The incredible political pressure to publish at least some evidence for WIMPS for to ensure the further grants and budgets. Of course it does - even the article title says it clearly: "possible evidence of WIMPs"
Far be it from me to call question the analysis of a working physicist. But I don't understand how these results can be consistent with basic Poisson Statistics. The have a predicted rate for false signals say "r". Over five years they have detected 3 events. Now I'm guessing what they did is they said r=0.5, they looked at a poisson statistics table and said there was only 0.0126% chance of obvserving 3. But that is of course a faulty way of analysing the results. Rather, one needs to ask given a measure value of 3, how likely is that to be consistent with a predicted rate of 0.5? If you do that calculation, you'll find 0.5 is just barely outside the 95% confidence interval. 5% is nothing. How many different types of signals did they look for? I bet more than 20, which means there is virtually 100% chance they would have found something like this, even if there are no WIMP particles. The AMS results suggest a particle around 1TeV (if it isn't just pulsar background) but that's well above their detector range so it's going to take a few years yet before this question becomes any clearer. It would be extremely helpful if this article gave more details. There are two questions one can ask. Given a known background rate of r, how likely is it to observe 3? The second is given you have observed 3, how likely this is consistent with a background rate of r. It is unclear which question is being answered by there 98.81% confidence this is a WIMP. My guess is there background rate is around 0.23, in which case the answer to both questions is about the same, but that is purely a guess on my part. Oh that is fun, I go to edit, and instead it posts new. Ignore my first comment, as readers will probably note, I shifted the decimal in my analysis, this making completely false conclusions. It would be extremely helpful if this article gave more details. And 3 sigma results come and go. Fermi-LAT had a 4 sigma result on the galactic core peak, but it was diminished by later data. From both empirical (neighboring galaxy emissions) and theoretical (if a WIMP) considerations, DM masses more than 40 GeV. If this is a real particle in the end, it won't explain DM as such. Regardless, research at the Super-CDMS facility and elsewhere will continue until WIMP collisions are proven to exist, or not. This extract from the article says it all. It is not possible to PROVE that WIMP collisions DO NOT EXIST, even if the research goes on forever. Its a bit like the Loch Ness Monster, it cannot be proven not to exist! THANKS -- i try to keep up on certain topics, but I missed those articles -- I appreciate your responce. Super-CDMS suggests a WIMP mass of 8.6GeV; AMS-02 indicates 300GeV or more; and we also have the Weniger line at Fermi which would imply a WIMP mass around 130−150GeV. The signals from all detectors should be coincident to say at least, because their sensitivity ranges overlap. These numbers are apparently inconsistent with each other and probably all artifacts, which have nothing to do with WIMPS.